In Gradius III the gentle Gradians thought they were cured of Bacterion's contemptible curse after generation of germ-free living. Guess again. 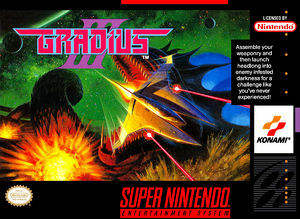 That wretched fiend is once again wreaking havoc on Gradius and the surrounding planets. It's your destiny to put an end to it. Unless maybe you think life as an amoeba would be pleasant! In the final forum, you'll have to be as tough as Orakian ore to confront Bacterion and disintegrate its hailstone of a heart. If you do, all that is good in the universe will breathe a sigh of relief. And if you don't, you'll hear the echo of a solitary clap and the final Dark Curtain will fall. The graph below charts the compatibility with Gradius III since Dolphin's 2.0 release, listing revisions only where a compatibility change occurred. This page was last edited on 7 December 2017, at 03:52.